Usually one expects to see the one-point jump in running fights; it is certainly the default play for getting into the centre. On occasion though it is useful to jump out using the knight's move. This is from Iwamoto Kaoru-Kitani Minoru (B) 1953-10-15. 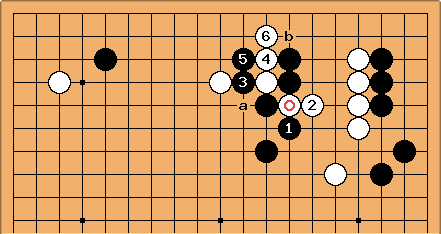 The virtues of over Black at a, are that it is somewhat lighter (sacrificing the square-marked stone later might be acceptable), and also that it moves Black's group one line to the left, away from White's wall and closing down on White's stone on the side. , rather than at b, perhaps requires explanation. To jump out to here goes too fast for good shape. 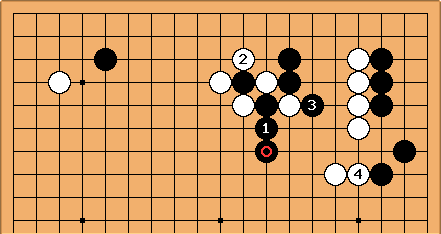 With and Black encounters a problem. allows ko lock with . 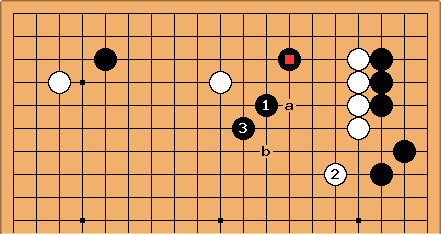 in answer to White's marked stone is always somewhat vulgar shape. 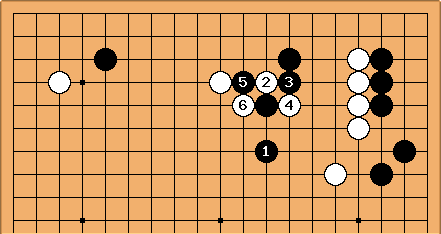 Here Black has to give up two stones after . Next Black a, White b and Black has no attack. This result gives White a potent ponnuki. Allowing White to play at can start a ko for high stakes. The stone then can't be considered well-placed.